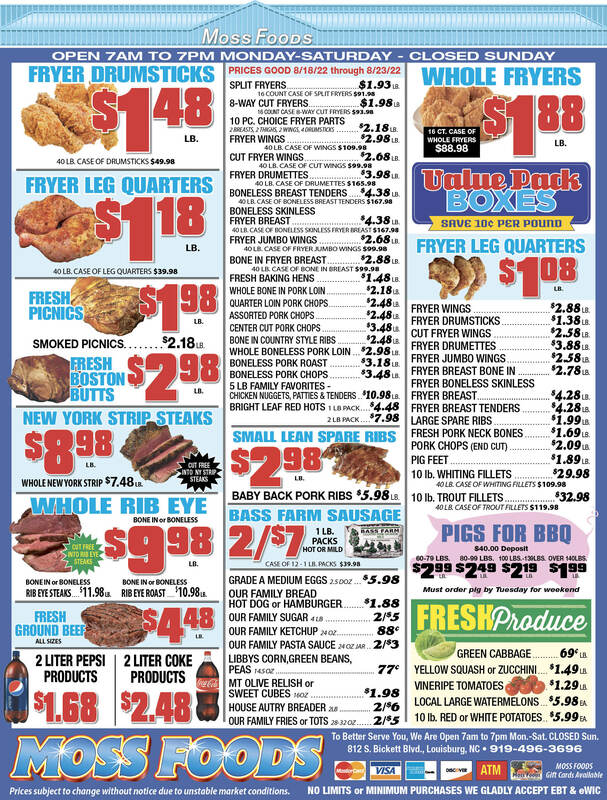 Showing 45 articles from February 22, 2013. LOUISBURG — The county’s Board of Elections is experiencing a shake-up. Larry Tetterton submitted his letter of resignation, citing health reasons. The remaining members of the board, Walter Yarbrough and Thomas Bregger, accepted the letter this past Monday. 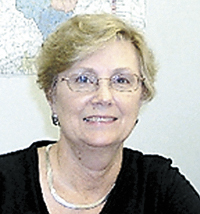 And Elections Director Amy Southerland announced that she will retire in April. LOUISBURG — Franklin County management has tabbed a do-it-all as its next emergency services director. But Jeff Lewis insists he’s not a know-it-all. 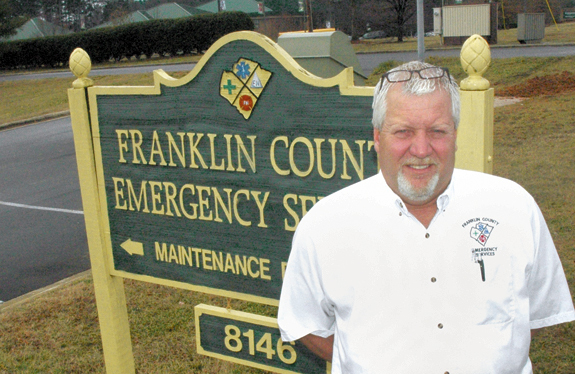 “I put myself in the employee’s shoes because I’ve been in their shoes,” said Lewis, who came to Franklin County in 2007 as a paramedic before working his way up to a management position, and now the director’s position. FRANKLINTON — Town Hall is proof that two roofs aren’t better than one. During the board’s Tuesday meeting, Town Administrator Tammy Ray informed commissioners that spending has picked up because staff is trying to address a roofing problem at Town Hall. A crew was called in to spray an adhesive membrane on the roof to prevent leaks. What was described as an “overview from 50,000 feet” of Americans’ health care reform this week provided some information on pending changes — but left many questions unanswered because reform is still being crafted. 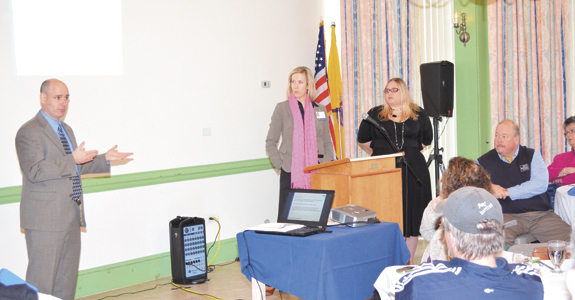 About 50 people attended a breakfast session hosted by the Franklin County Chamber of Commerce Tuesday at Louisburg College to learn about health care reform and how it may affect them or their business. GOOD MORNING: Didja see where WCBS news anchor Rob Morrison made the news himself? It’s a fact. Morrison was taken into custody last Sunday at his home for allegedly choking his wife Ashley with both hands during a domestic dispute, according to a CNN news report. And a Texas woman gave birth to four babies – two sets of identical twins – all boys, on Valentine’s Day. Wow! What a day! 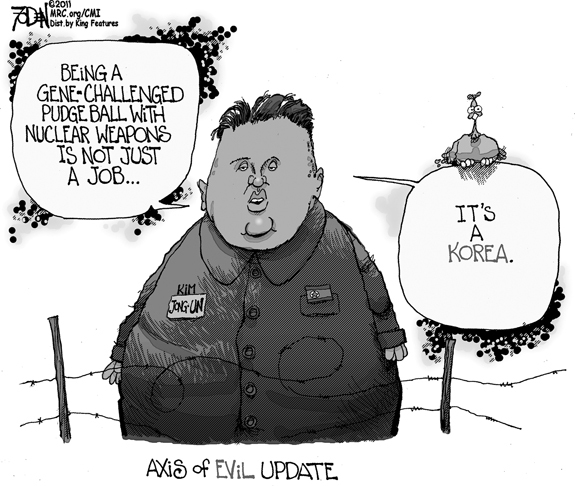 Let’s start this Saturday morning with a correction — of sorts — to an editorial cartoon that appeared in our midweek edition. In case you missed it, a mini-version is to the right. That cartoon features a paper airplane, a drone of sorts, bouncing off the head of a large, rotund, sleeping but well-dressed gentleman. The best idea I’ve heard in a long time got a lukewarm reception in Louisburg this week — but I’m hopeful the idea will grow to reach its potential. The idea, from Louisburg College President Mark La Branche, is to create a Tar River Center for History and Culture and use it as a tool for economic development as well as preserving history. I am pleased to see that Louisburg College president, Mark La Branche is taking the lead in an attempt to bring a Tar River Center for History and Culture to our county. This activity has the potential to establish student life at Louisburg College as an intrinsic aspect of all areas of the county and for the benefit of everyone living within the Tar River Basin. FRANKLINTON —Quentin Cortez Cannady, 46, formerly of Franklinton, died Saturday, Feb. 2, 2013 in Baltimore, Md. 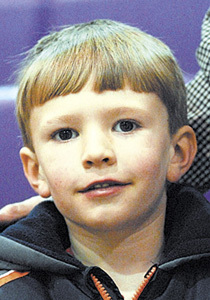 Funeral services were held Saturday, Feb. 16, at First Baptist Church in Franklinton, with the Rev. André Johnson officiating. Interment followed in Fairview Cemetery, Franklinton. LOUISBURG - Funeral services for Florence Y. Solomon, 73, who died Friday, Feb. 15, 2013, will be held at 2 p.m. today (Saturday, Feb. 23) at Guilfield Baptist Church, with Bishop Johnny Alston officiating. Burial will follow in the church cemetery. ZEBULON - Paul Wilson Collie Jr., 68, died Wednesday, Feb. 20, 2013. A graveside service will be held at 3 p.m. today (Saturday, Feb. 23) at Gethsemane Memorial Gardens, with Masonic rites. FRANKLINTON —Bennie Ray Morris, 65, died Sunday, Feb. 17, 2013. Arrangements by Feggins & Feggins Funeral Home, Wake Forest. FRANKLINTON - Janie Penney died at home, on her beloved farm, on Friday, February 15. She had fought cancer many years, but her strong faith allowed her to always rest assured that she would go to a better place. She is there now. LOUISBURG - Eleanor P. Denton went to be with the Lord, whom she loved so much, on Wednesday, February 20, 2013. All whom she touched and loved will miss her greatly. Her family and friends will always remember her as a sensitive, selfless and loving person who gave of herself tirelessly and totally. RETRIEVAL SYSTEM. Louisburg’s Tyreka Kearney (left) gains possession of a loose ball during her club’s loss to North Johnston on Wednesday at the Northern Carolina Conference Girls Basketball Tournament. WENDELL -- After seeing North Johnston twice during the regular season, Louisburg High School coach Sarah Bolten knew she had a tough defensive decision to make heading into Wednesday’s semifinal of the Northern Carolina Conference Girls Basketball Tournament. A stickler for man-to-man defense, Bolten saw North Johnston shred through that strategy during the first meeting of the campaign -- which was won by the Lady Panthers. IT’S GONNA BE CLOSE. 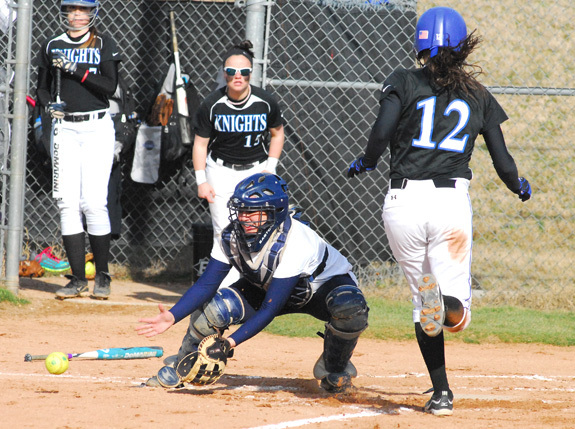 Louisburg College catcher Sommer Di Fulgo (left) tries to reel in a throw as Surry CC’s Natalie Hauser prepares to cross the plate during Wednesday’s twinbill. Hauser was safe on the play. 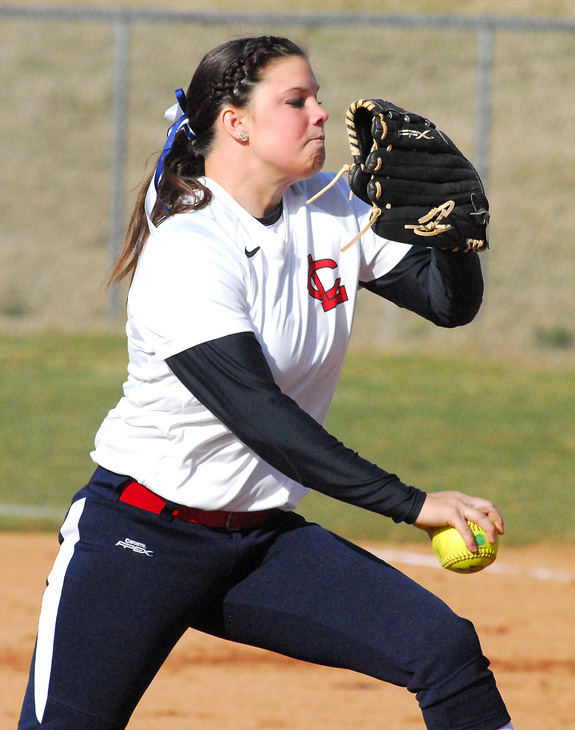 LOUISBURG -- Even a hard-hitting team is going to experience days when the bats go cold -- as evidenced by Louisburg College’s second-game performance Wednesday against Surry Community College. After riding a Morgan Tharrington longball to a 5-2 victory in the opener, LC stranded 11 baserunners in the finale as Surry evened the day with a 6-2 conquest. BATCHELOR COMES UP BIG. 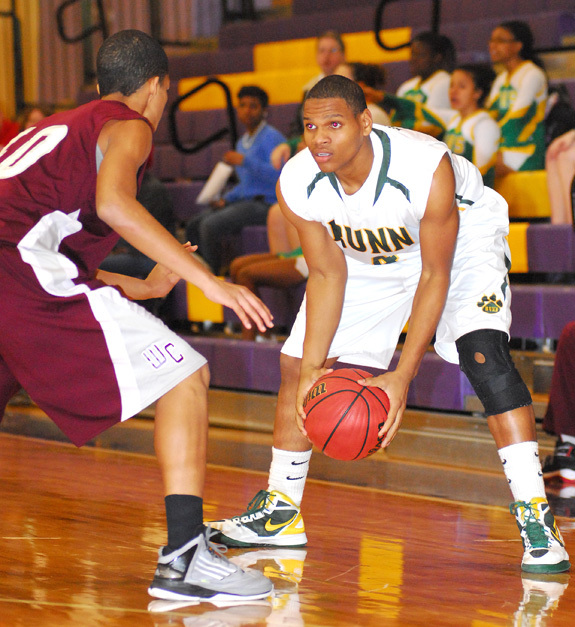 Bunn’s Brandon Batchelor (right) has played well this week at the Northern Carolina Conference Boys Basketball Tournament. 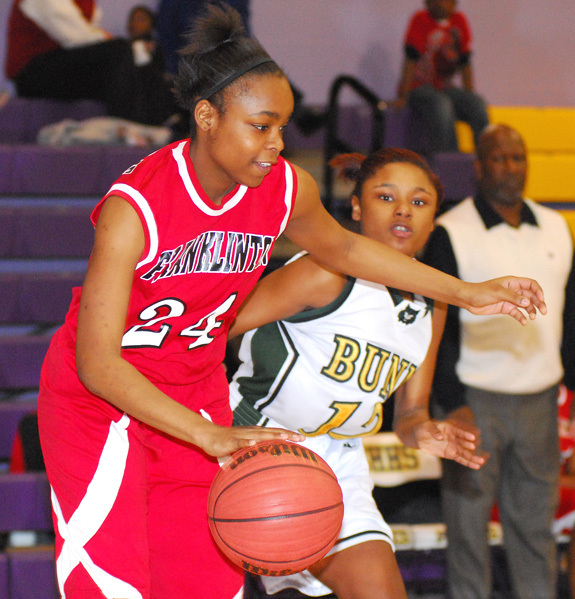 BHS took on Corinth Holders in Friday’s title game. WENDELL -- Disgusted and distraught, a furious Gerald Melton rose from the bench to call time-out less than three minutes into Bunn’s semifinal meeting with Warren County at the Northern Carolina Conference Boys Basketball Tournament. It would be an understatement to say that Melton -- BHS’ long-tme coach -- was not pleased with his team’s early effort in the campaign’s rubber match with Warren County. LOUISBURG -- Three Louisburg College athletic teams have cancelled competitions scheduled for this weekend. Baseball’s four game series (Fri-Sun) versus Glen Oaks CC has been cancelled, with no makeup date set as of yet. WAKE FOREST -- Wake Electric is accepting applications from middle-school students for scholarships to summer basketball camps on two of the state’s largest campuses. Young women can apply to attend the Kellie Harper Basketball Academy at North Carolina State University in Raleigh and young men to attend the Roy Williams Basketball Camp at the University of North Carolina at Chapel Hill this summer. 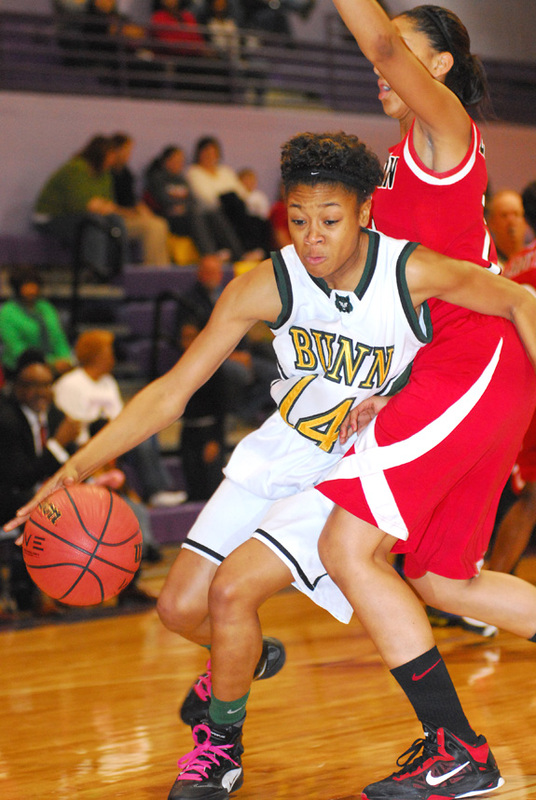 WENDELL -- Bunn was on the cusp of hardwood history heading into Friday’s Northern Carolina Conference Tournament Championship Game. BHS hasn’t dropped a NCC matchup in four seasons -- a streak the Ladycats could have continued in the league tourney finale against North Johnston. LOUISBURG -- The #2 Louisburg College men’s basketball team got it done at both ends of the court Wednesday night as the Hurricanes easily handled Guilford Tech CC, 118-67, in a Region X contest at Taylor Center on the LC campus. The Hurricanes took a 60-24 lead in to the break and didn’t let up in the second half as they outscored the Titans 58-43 in the second period. DURHAM -- The Durham Bulls have announced that the organization will host the 2014 Triple-A All-Star Game at Durham Bulls Athletic Park. The 27th annual Triple-A All-Star Game will take place on July 16, 2014 and will be nationally televised on MLB Network. TRE’-MENDOUS. 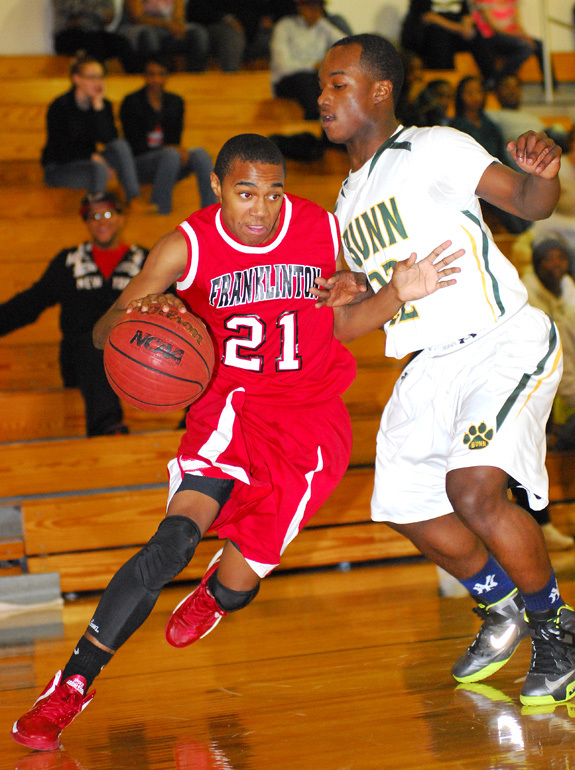 Franklinton’s Tre’ Gaither (left) makes his way to the basket during Tuesday’s road game at Bunn in the first round of the Northern Carolina Conference Boys Basketball Tournament. BUNN -- Misery loved field-goal shooting company during Tuesday’s contest between Franklinton and host Bunn in the first round of the Northern Carolina Conference Boys Basketball Tournament. Both clubs struggled mightily from the field before the Wildcats were able to drain enough shots in the second half to pull away for a 47-31 decision. RALEIGH -- North Carolina State University head baseball coach Elliott Avent scored his 600th career win with the Wolfpack as Logan Jernigan and Ethan Ogburn combined to shut out Charlotte 5-0 on Tuesday at Doak Field on the NCSU campus. Avent is a former Louisburg College assistant coach under Russ Frazier. He grew up in Aventon in Nash County. ZEBULON -- The Carolina Mudcats will host their annual Job Fair on March 2 between 10 a.m. and 2 p.m. inside Cattails Restaurant at Five County Stadium in Zebulon. There are many different positions available at Five County Stadium, to work during 70 home games and a handful of other events throughout the year. 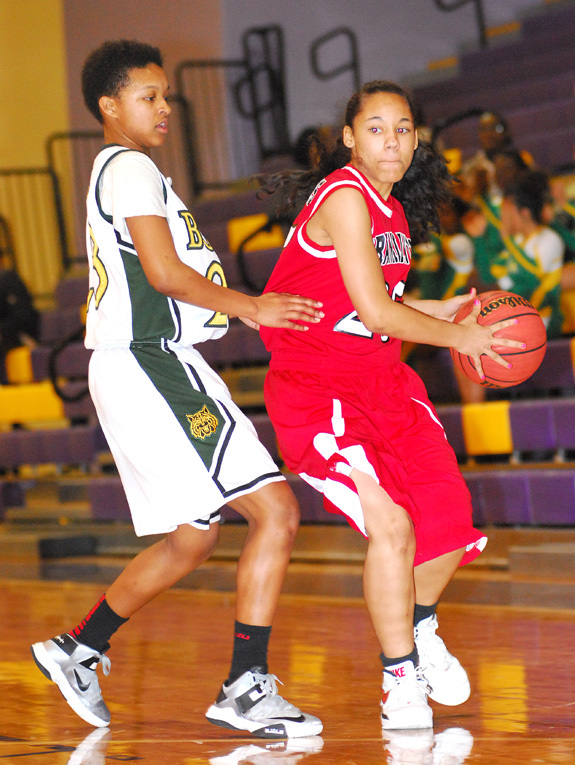 Franklinton’s Brie Wakefield (right) tries to avoid the defense of Bunn’s Precious Walker. Bunn’s Tainasha Vines (left) tries to drive on Franklinton’s Charity Snelling during Wednesday’s semifinal contest of the Northern Carolina Conference Girls Basketball Tournament in Wendell. 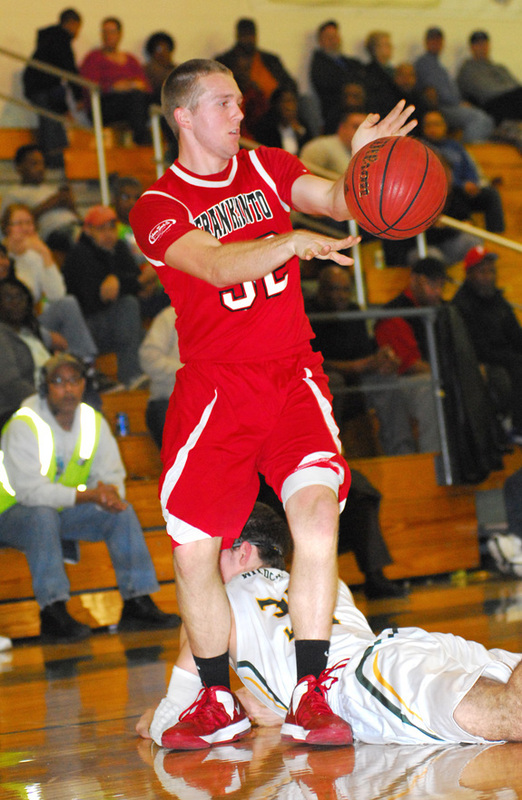 Franklinton’s Matthew Davis makes a pass during his team’s loss to Bunn on Tuesday in the first round of the Northern Carolina Conference Boys Basketball Tournament. 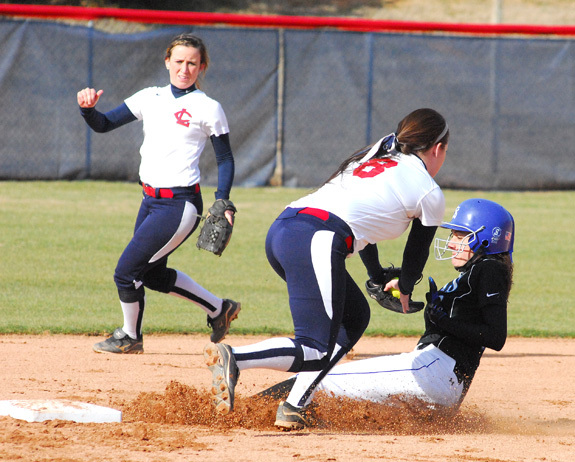 Louisburg College’s Morgan Tharrington (middle) tries to thwart a stolen base attempt Wednesday afternoon during the Lady Hurricanes’ home doubleheader against Surry CC. 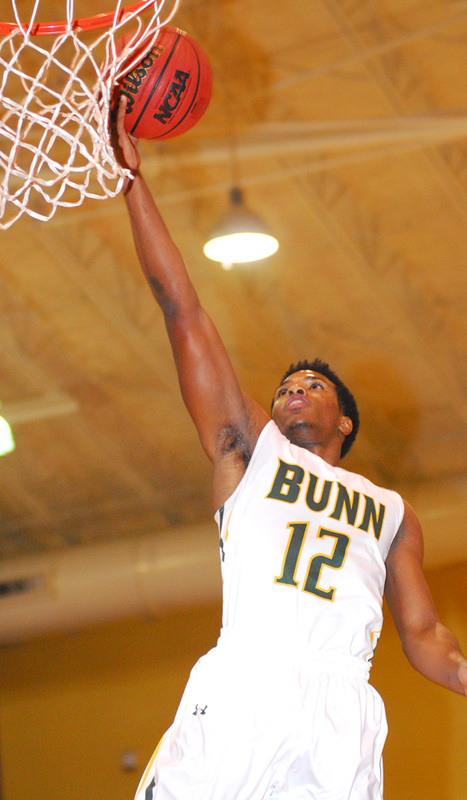 Bunn’s Johnathan Alston scores on a layup against Warren County. 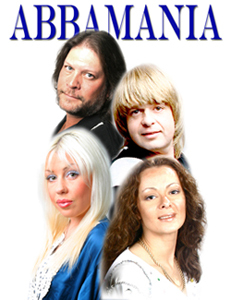 ABBA-MANIA will perform in the Seby B. Jones Performing Arts Center (JPAC) on the campus of Louisburg College on Friday, March 15, beginning at 7:30 p.m. This electrifying show will take you back to the Disco era and one of the best pop bands in history: ABBA. Having fun are (from left) Peggy Harris, Ann Carter and Hannah Carter. 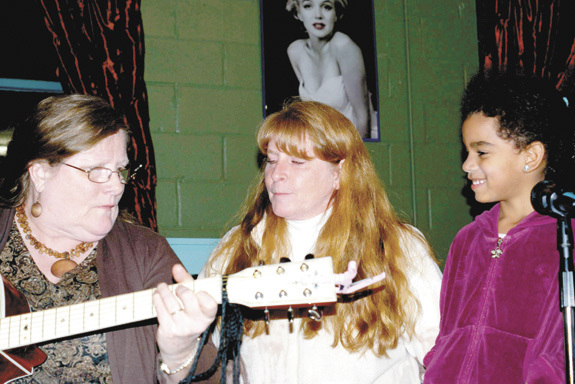 Patrons of the music arts join together on a little stage in a coffee shop to enjoy a Music Jam in what might seem an unlikely place – Common Grounds Coffee House in Bunn. The location is ideal for a communal jam session with needing a sound system and stage for local talent to gather every first Saturday night. Due to a communication error, there will NOT be a gospel singing at Perry’s Chapel Baptist Church, Franklinton (Landmark Trio) on Saturday, Feb. 23, as published in the church news of the Feb. 20th edition of The Franklin Times. The singing will be rescheduled at a later date to be announced. FRANKLINTON — An internal audit revealed discrepancies that, if not addressed, could have cost the town thousands of dollars. Scott May with May and Place presented commissioners with its audit report, giving the town a clean bill of financial health. LOUISBURG — Two Youngsville businessmen who petitioned the courts to review and, ultimately, overturn a decision that denied them the ability to open a gun range have amended their complaint. Aaron Byrd and Eric Coombs applied for a special use permit this past fall to build a shooting range on a portion of a 171-acre tract on Dunn Road in the Margaret Community east of Louisburg. Franklin County’s Volunteers in Medicine, in association with the Phil Ford Foundation and Franklin Regional Medical Center, is hosting a breakfast with Phil Ford on Wednesday, Feb. 27, in the auditorium at Louisburg College. Breakfast will be from 7:30 – 8:30 a.m. and a meet and greet with Phil Ford will take place from 8:30 – 9:30 a.m.
Louisburg Elementary School recently won runner-up in the Carolina Panthers Design a Rock Contest. Fourth graders voted on the design and painted it. LES art teacher Rachael Ball put an announcement out for needing a boulder. Sammy Leonard contacted Professional Stone of Bunn and they donated a 3,000 pound rock. LES‘s art department now has $400 to spend for winning. FRANKLINTON — A former police officer was reinstated by the Highway Patrol. According to court documents, Wade Bulloch worked as a trooper from 1989 until 2005, when he was dismissed for unacceptable personal conduct. Bulloch has been fighting the decision and had worked with the Franklinton Police Department until the state Court of Appeals ruled in his favor this winter. Air National Guard Airman 1st Class Lauren C. Gray graduated from basic military training at Lackland Air Force Base, San Antonio, Texas. Bunn resident Amy Denton and Franklinton resident Delayne Baird have been named WakeMed Circle of Excellence Award winners, the hospital system’s highest employee honor. Close to 100 WakeMed employees were honored with the recognition, which is bestowed upon those who fully embrace WakeMed’s policies and culture of safety, produce quality work in an efficient manner, communicate clearly and participate in process improvement initiatives, according to a hospital spokesman. 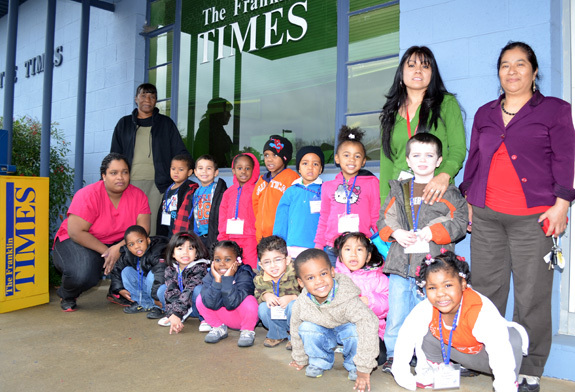 Nelson Head Start recently visited The Franklin Times to learn how the newspaper operates.